BLOOMINGTON, IL — Some live albums are so good they become the recordings those artists are known for. Frampton Comes Alive and Cheap Trick at Budokan were monster hits and catapulted them to rock superstar status. 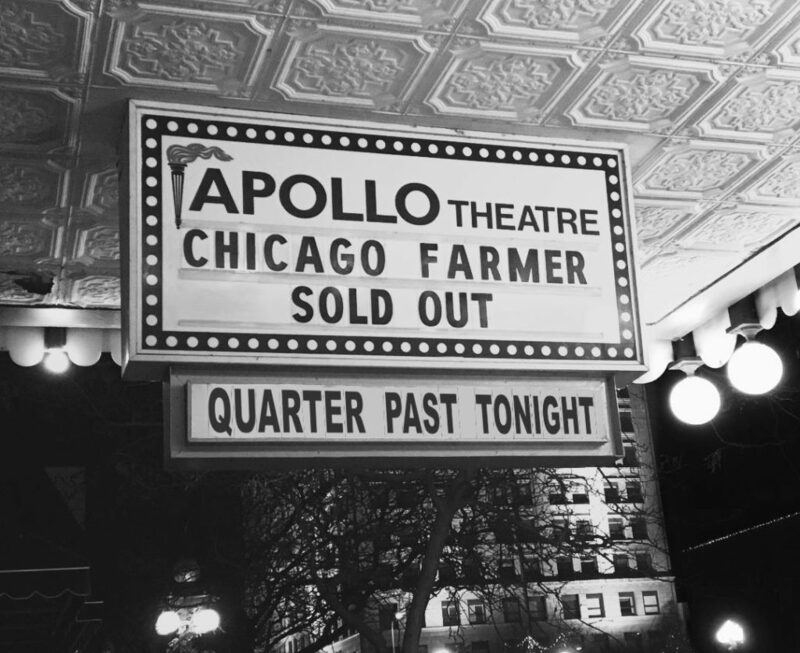 Cody Diekhoff, too, has big hopes for his first live Chicago Farmer first live album, Quarter Past Tonight, a two-disc set to be independently released Aug. 3. “Folk superstar would be just fine,” Diekhoff says. A touring musician for 20 years with a quarter century of writing songs under his belt, Diekhoff has seen the type size for his moniker grow steadily larger on festival posters over the years. He called his 21-song 2005 debut album About Time, and the same title would have fit for the new live album, recorded Dec. 1-2, two sold-out nights at the Apollo Theater in Peoria, IL in 2017. This is a solo record with Cody being the only performer, singing and playing guitar as well as harmonica as Chicago Farmer. Fans have requested a live album for years with a love for his stories and banter as much as his songs. Quarter Past Tonight is a celebration of a musical career in which he’s recorded five studio albums of Chicago Farmer music, criss-crossed the country playing thousands of shows, and shared stages with Robert Earl Keen, Todd Snider, Greg Brown, Greensky Bluegrass, The Wood Brothers, Elizabeth Cook, Wayne Hancock, Del McCoury, and Gene Ween — the last two on the same weekend. It also marks a milestone in his life, coming out just before his 40th birthday. “This is kind of my big tribute to me for sticking around this long,” he says. Growing up in the tiny Illinois town of Delavan (born the same year Cheap Trick at Budokan was recorded), Diekhoff got the writing bug in high school, translating daydreams into stories. He thought of becoming an English teacher… but then he got a guitar. A friend’s father with a guitar introduced him to the timeless artistry of Hank Williams, and when he moved to Chicago after high school he went to the famed Old Town School of Folk Music to hone his harmonica skills and took a deep dive into work of John Prine and Steve Goodman, giants of the Chicago folk scene. Neil Young, John Fogerty, and Arlo Guthrie were among the other role models Diekhoff turned to as he launched his career. The storytelling he does came early on, from having to fill a four-hour gig without repeating his songs, so he began crafting elaborate introductions to his songs. “In some cases, I guess the story of the song became more entertaining than some of the songs themselves, so people started reciting and requesting those as well,” he says.